For centuries, poets, writers and artists have found the Scottish Borders to be an inspirational muse. These debatable lands, once the site of violent civil war, preserves a rich traditional heritage in farming life and folklore, ancient abbeys and castles, as colourfully described in the Border Ballads. 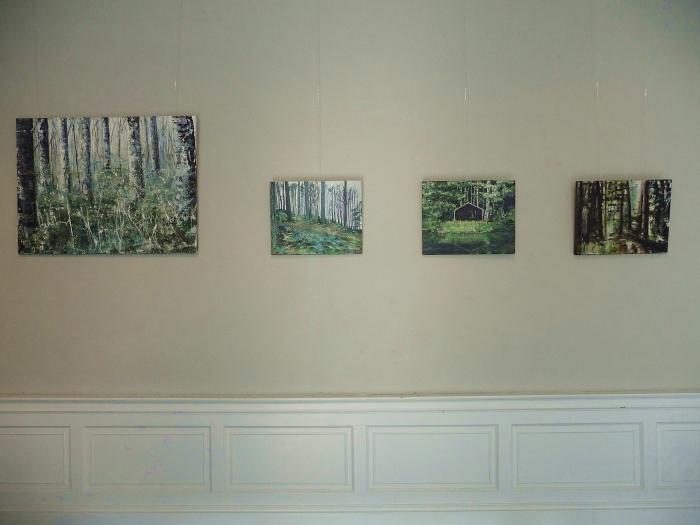 Through the Spring and Summer this year, Artist Rose Strang has been travelling around the peaceful, scenic landscape from the fishing villages of Berwickshire across the rolling farmland and river banks of Tweeddale and Yarrow. 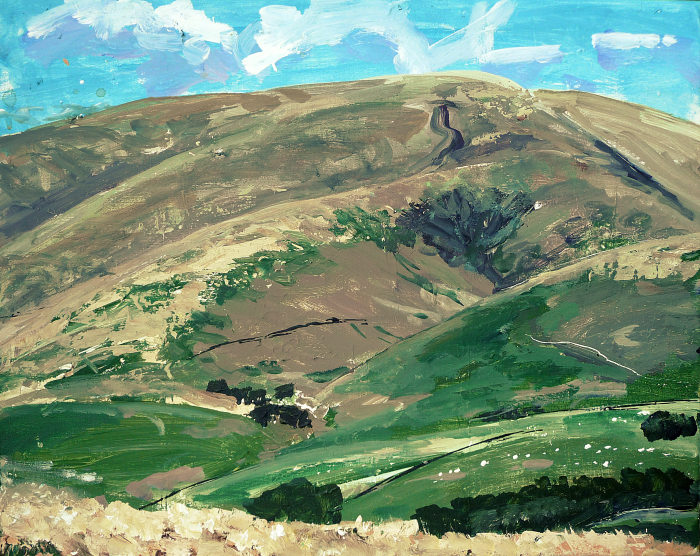 She has been visiting the Borders since childhood, so this has been both a journey of happy memories as well as the opportunity to capture the natural beauty on canvas. 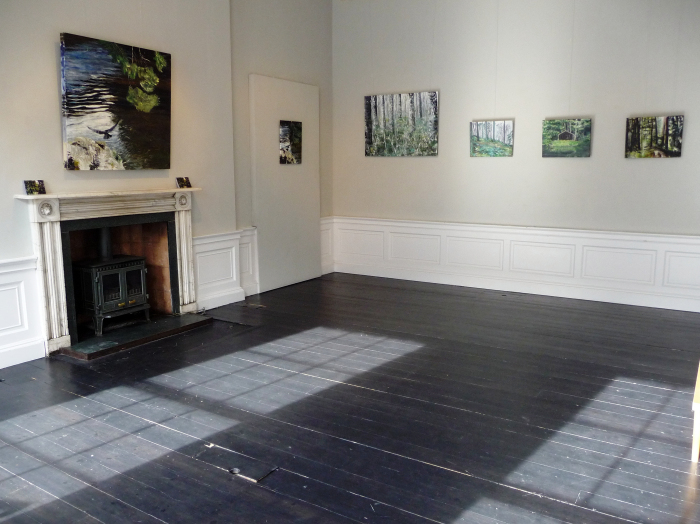 Whitespace Gallery is a spacious rectangular room with huge sash windows, where fifteen paintings, varying in size, are well presented around the walls; the title of the exhibition, The Green Woods Free is taken from a Border Ballad, Erlington. Let Rose take you on a painterly walk around the lush green Borders’ countryside, through the forest of Glentress (renowned for mountain biking), along the River Tweed to see a glimpse of Neidpath Castle peeking through the branches up on the hill and travel on to the panoramic views across the valley to the Moffat Hills. There’s a distinctive sense of physically being outside in the open air as you study each canvas; it’s the subtlety of soft shades, thin shards of sunlight through leaves as well as such a realistic perspective of each landscape. I would advise you to stand back near the windows to view “Birch, Gladhope” hung on the far wall, to appreciate the bewitching, moody light of the woodland with its thick undergrowth below the slender, silver bark of the tall trees. Then go up close to observe the fine detail of this masterly botanical drawing: you can almost smell the fragrant scent of the grass, moss and lichen after the rain. 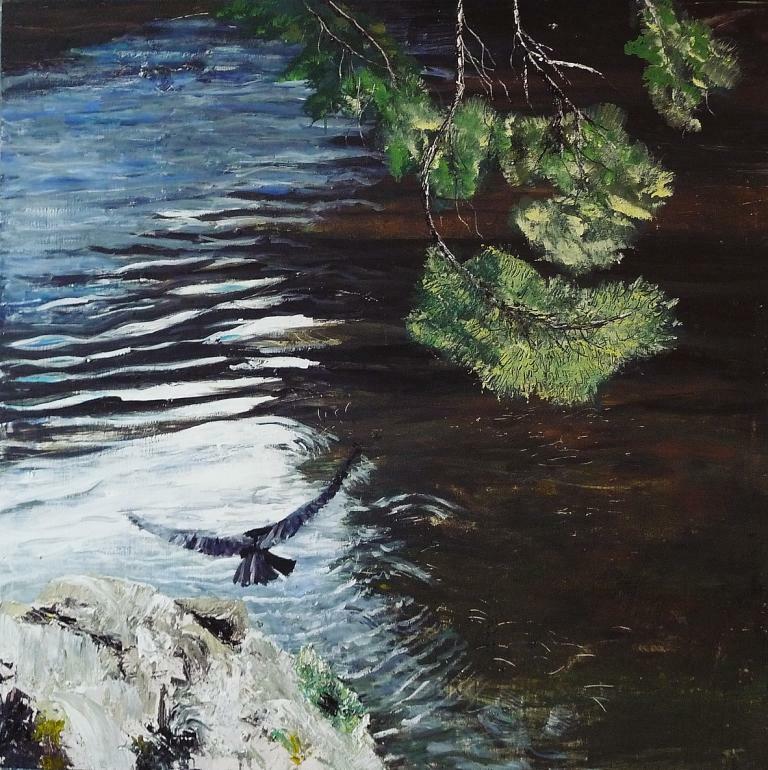 Above the fireplace hangs another superb scene, “Hawk, River Tweed” with shimmering light on the water below the hovering bird as if time has been paused to create a calm moment of stillness. This is exquisite artistry. 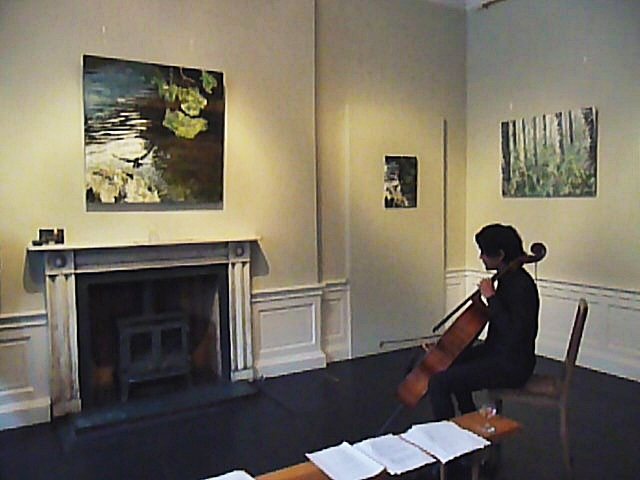 We were privileged on the opening night to be treated to a mini-concert by the cellist Atzi Muramatsu, who played one of his own compositions, inspired by Hawk and these Green-woods. This was a beautifully soulful accompaniment to enhance Rose Strang’s enriching, enchanting luminous visions of nature in the wild tranquility of Scottish Border country. 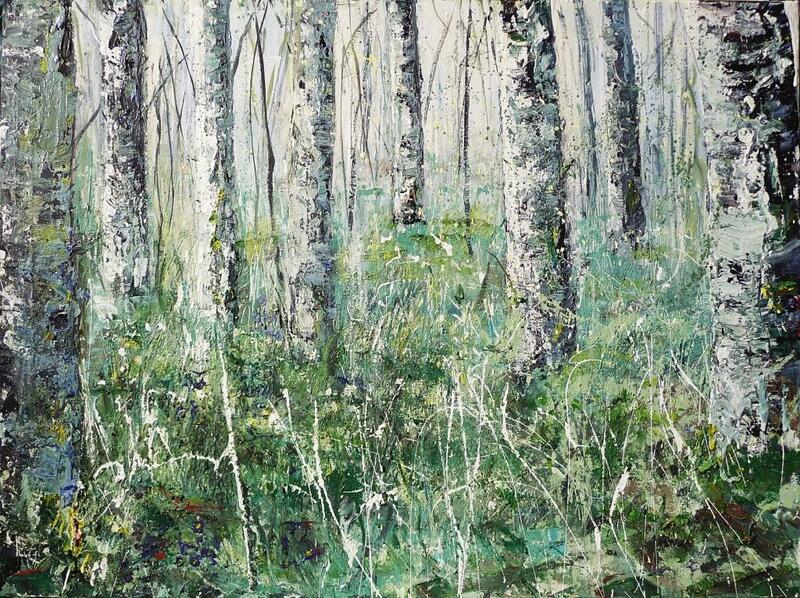 Green-Woods Free by Rose Strang @ Whitespace Gallery, 25 Howe Street, Edinburgh, EH3 6TF. Dates – 18th July to 23rd July, 2015. 1000-5pm daily. This is a video of Rose Strang at work as she creates her masterpiece, Hawk, River Tweed to the dreamy piano music, Oceans by Jane Gardner. Sit back, watch and listen for a unique artistic treat. Over the past few days I have visited galleries around Stockbridge and the New Town to see two stunning new exhibitions by two women artists with their own distinctive, dynamic vision. From 3 – 15 July, at Patriothall Gallery, Hamilton Place, Stockbridge, you can view the stunningly atmospheric paintings by Eva Mitera. Having studied Fine Art in Warsaw, she then graduated with an MSc in Design and Digital Media from Edinburgh University and today divides her time between Scotland and Poland. Trina Bohan is originally from New Zealand where she studied Graphic Design. Having travelled around the world, she was immediately inspired by the cultural, cosmopolitan Edinburgh – her new adopted home for the past six years. 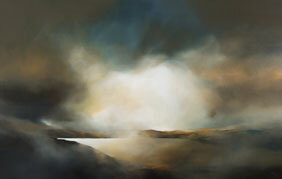 Timelines, is a selection of Scottish landscapes and figurative studies at Arusha, Dundas Street. The Gallery was recently the only Scottish representative at Art 15, London, showing a diverse range of artists with great success. 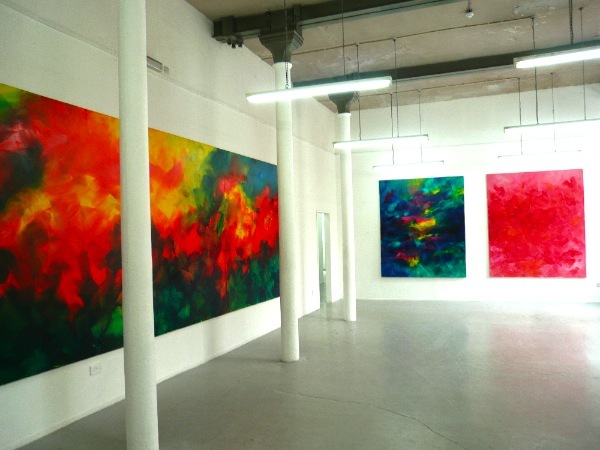 WASPs, the artist collective, converted the old Co-op bakery in Stockbridge into a complex of 50 studios with Patriothall gallery on the ground floor. In 2004 the artists won a hard fought campaign to save the building from developers assisted by a grant from the City of Edinburgh Council and great support from public petitions. I see regular exhibitions at Patriothall and I can honestly say that I have never seen the huge garage-like space complementing the art so brilliantly. 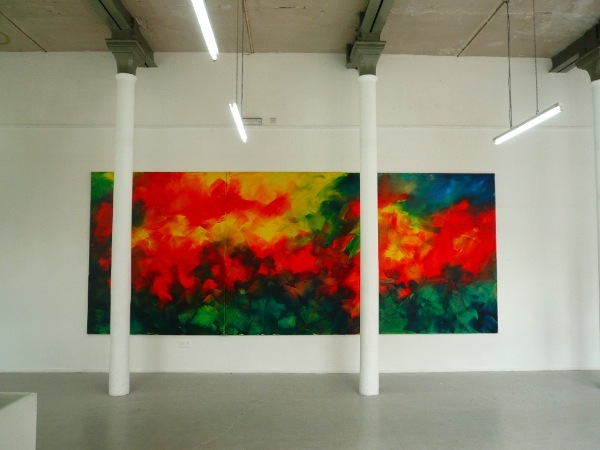 Here, the high white-washed brick walls from floor to ceiling is the ideal industrial backdrop for Eva Mitera’s huge colourful canvases and triptychs. Credit is clearly due to the Curator, Shi-Mei Lee for her design to show the work to its best advantage. I attended the Private View of the exhibition at 6pm on Friday 3rd July – but very surprisingly there was only one other guest there for over an hour; (normally Patriothall is a buzzing meeting place of artists and art buyers). I would have thought that the Polish Consulate in Edinburgh could have perhaps sponsored an opening launch to support Eva Mitera and the Polish-Scottish link -this exhibition is promoted on their website. I therefore had a personal show round by the artist herself. The abstract works are deliberately untitled to allow the viewer to use their own imagination to feel, see and understand the bold, brash, brush strokes. The colours are vibrantly vivid in the wild patterns of blues, greens, splashes of cerise and bursts of sunshine yellow. In contrast, an explosion of pink across a canvas is like a flutter of flower petals. Eva explains that she uses primary colours and allows the paint to merge with each at will, often with surprising results she says, where a slick of orange or emerald will appear in the blend of oils. 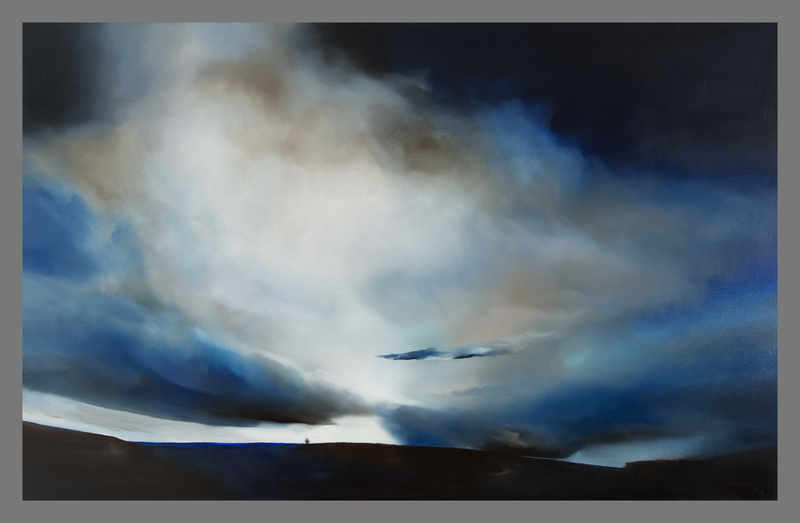 Next door in the rear gallery – Eva calls this the cool room – is a very different series of blue and white scenes which depict cloud formations and stormy, rain filled skies. Eva Mitera is clearly an extremely talented young artist. She was shortlisted at the prestigious Austrian painting competition Strabag Art Award 2014 and this year will take part in Florence Biennale and Beijing Biennale. This is fresh, exciting, innovative art, full of light, energy and passion. So do visit the Patriothall Gallery soon and take a slow, leisurely stroll around this impressive collection of abstract Expressionist paintings. 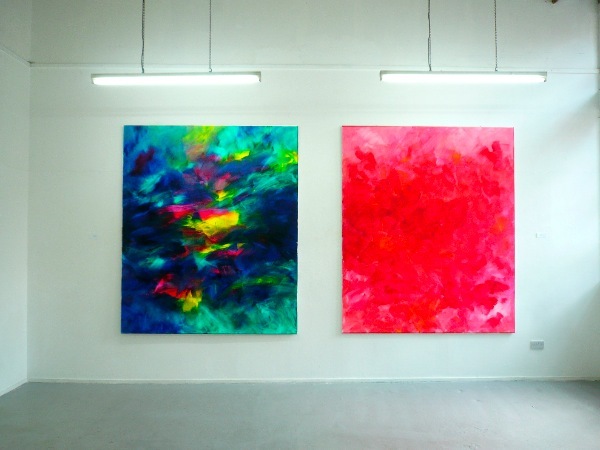 Eva Mitera Paintings, 3 – 15 July, 2015. 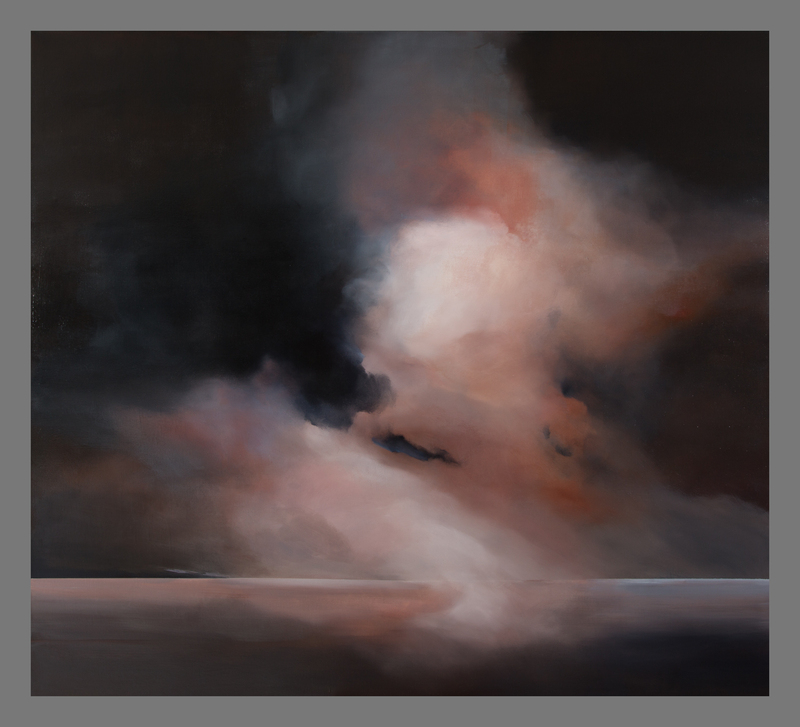 Over at Arusha, Dundas Street, Trina Bohan’s exhibition is called Timelines described as “new skyscapes set against the lochs and seas … fleeting moments of shifting light and clearing mists in the rich and powerful Scottish landscape”. The Georgian architecture of the gallery, spacious white salons, high ceilings and ornate cornices, is a fine setting to enhance the dark, dramatic paintings of sea, sky and distant horizons. Just like the masters of Impressionism, Monet, Renoir, Pissarro, Cezanne and Van Gogh, Bohan sketches outdoors en plein air; the scene is observed and salt-sea breeze is felt, to capture the elements of the weather and a true sense of place. Take a journey around the Hebrides here, to witness the wild natural beauty of Luskentyre reproduced in rhythmic swirls of greys and blues. Elsewhere there are images of the cool winter sun, warm coral sunsets as well as sharp shafts of light above Loch Ness to brighten its legendary, mysterious gloom. These stunningly atmospheric paintings have a real Turneresque quality in Bohan’s meticulous handling of light and shade, the shimmer of water and cloud patterns across endless skies. There’s a real calming effect in these serene, desolate land and seascapes, luminous and moody with a surreal dreamlike vision. 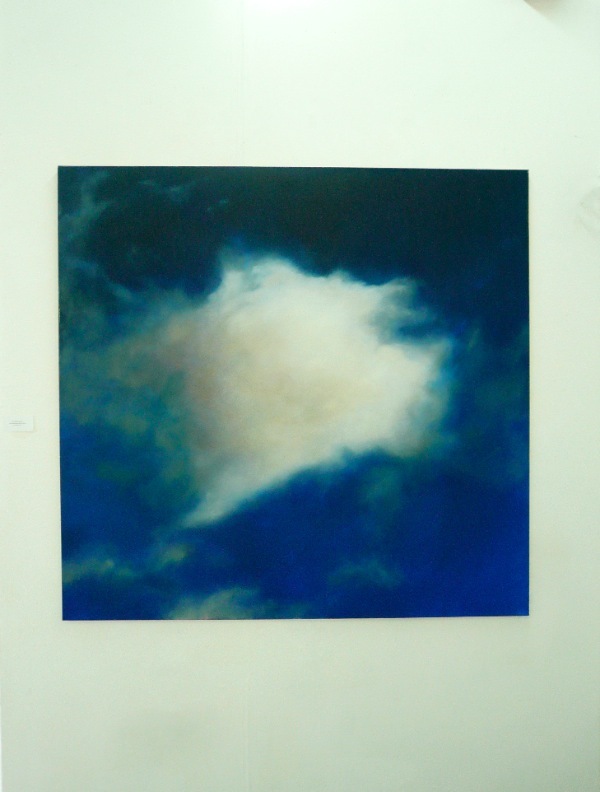 Trina Bohan has exhibited worldwide in the UK, USA, Bangladesh, Zimbabwe, Papua New Guinea and Indonesia. While travelling in Bangladesh she was inspired by the street life of Bangladesh, – the flower sellers, weavers, musicians and bird sellers. “Street Traders of Bangladesh” was the subject of an exhibition and book. Timelines by Trina Bohan continues at Arusha Gallery 3 – 31 July, 2015.